by Schweizer Radio DRS, Radiostudio Zürich. Recorded, mixed and mastered by Daniel Dettwiler, Idee und Klang Studio, Basel. Photos: Franca Candrian and Dean Jaggi, Luxwerk Zürich. Graphic design: Jonas Schoder. Liner notes: Peter Rüedi. Produced by Michael Jaeger and Intakt Records, Patrik Landolt. Der junge Zürcher Tenorsaxophonist und Komponist Michael Jaeger fällt durch sein Spielkonzept und die Individualität eines Improvisationsstils auf, der verschiedenste Einflüsse aus freier, modaler und harmonisch gebundener Spielweise mit einem grossen, reifen Ton verbindet. 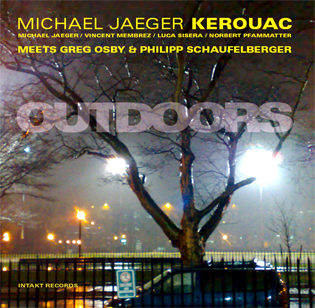 Nun legt Michael Jaeger mit Kerouac die zweite Platte mit dem Titel «Outdoors» vor. Für sein neues Programm lud er zwei Gäste ein: den Altsaxophonisten Greg Osby und den Gitarristen Philipp Schaufelberger. Kerouac entwickelt in den acht neuen Stücken einen solchen Sog, dass die Gäste so integriert werden, als gehörten sie seit Jahren zur Band. Michael Jaeger keeps looking in the quartet KEROUAC with the pianist Vincent Membrez, the bassist Luca Sisera and the drummer Norbert Pfammatter since 2005 persistently and with more and more success for the labile balance between selffulfillment and control. Between freedom and structure. Between individualism and the collective. Today KEROUAC is on such an advanced level of the collective consciousness, that the four can launch each other almost telepathically into creative spaces. More than that: the collective understanding generates such a pull that even the guests Greg Osby and Philipp Schaufelberger are integrated almost on the spot, almost as if they were members of the band for years. They make most inspired improvised or composed music that does not aim to anything but itself, let alone any ideology whatsoever. Their music is even allowed to swing every now and again, it often develops a bewitching melodiousness yet goes audaciously to the borders of the atonal or noise making. In other words: It roots in the centre of “jazz” and at the same time far outside any cliché, thus really happening in the very moment. So this is what Whitney Balliett, the doyen ofjazz criticism, used to call this music: “the sound of surprise”.